"I tell you un secreto pequeno, nina. Only two things matter in life. How we love and how much we love." It's rare that I thoroughly enjoy a book as much as I did If Birds Fly Back. Smart, carefully crafted, and full of heart, this summer debut had me falling in love with Sorosiak's story and characters. AAt times, this novel reminded me of Paper Towns and Wherever Nina Lies, two other books that revolve around the disappearance of a spirited young woman. Although there are clear similarities, I was interested in Sorosiak's approach to the plot and her strong depiction of those left behind by people who run away. I was also intrigued by Sorosiak's decision to center much of the novel on an elderly man and his life in a nursing home, simply because it's not very common for young adult books to spend much time discussing problems of the old and the dying. Ugh, Sebastian and Linny's relationship was just so dang cute. Equal parts serious and giggle-inducing, their romance had me grinning throughout most of the novel. Pair their blossoming love with an interesting mystery or two and bam, you've got yourself a novel to pack with you on your next beach vacation. 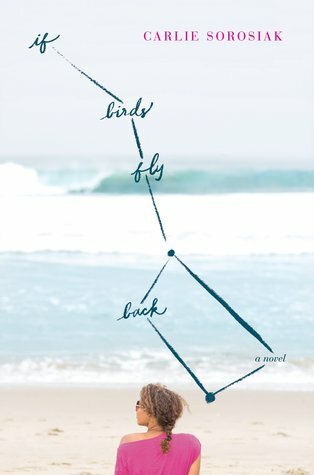 Like many young adult contemporaries, If Birds Fly Back is very much a classic coming of age novel. However, I was extremely impressed by Sorosiak's writing and ability to weave important themes about growing up into a story with so many different plot lines. We here from Linny, who has lost her sister, and Sebastian, who has never known his dad. They struggle with different issues for different reasons, and yet we witness both of them as they pick up the pieces and learn to move on in life. Overall, I was really impressed with this first novel by Sorosiak, and I'll definitely check out any other novels she may write in the future. Do yourself a favor and spend some time with Linny and Sebastian. Who knows? You might even walk away with a better understanding of your own wings.